I first discovered The Robinhood Pub when I lived across the street at Emporium Suites. For me it was a go to place for a beer with friends or to watch a game. It’s just your typical unpretentious, down-to-earth English pub. 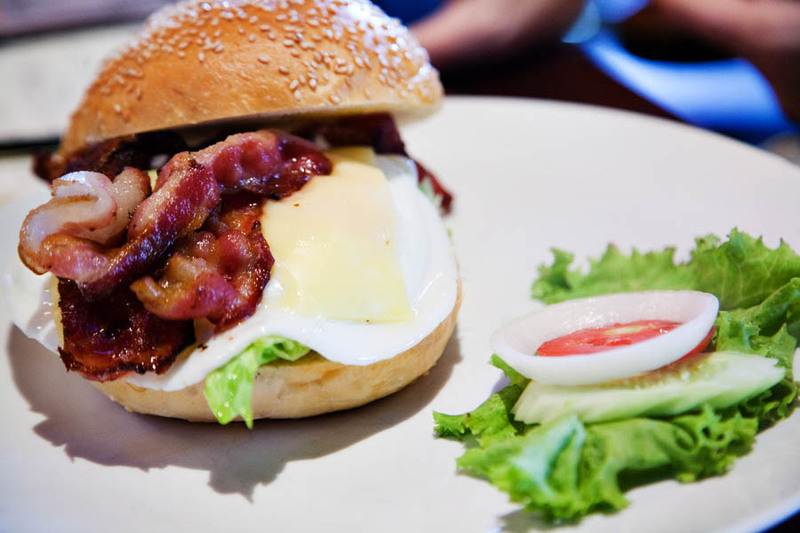 The crowd is varied….expats and Thais of all ages…the burger is good…and the beer is reasonably priced. So when Paul told me they also served breakfast, I had to check it out. We love the Dubliner breakfast, so I wondered how The Robinhood would stack up. 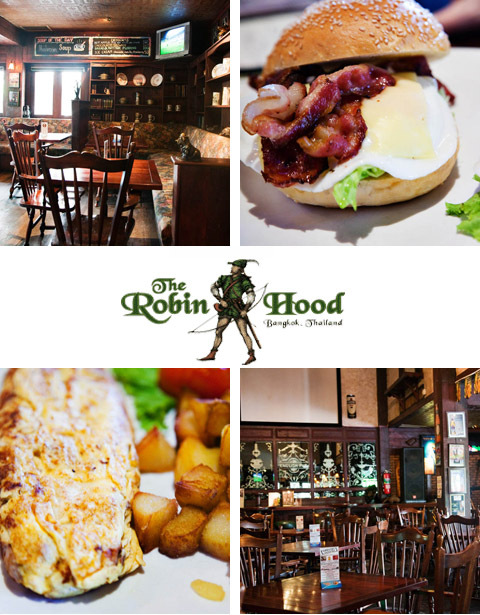 Breakfast or brunch at the Robinhood is served Mon – Fri, 10am to 3pm and Sat – Sun, 9am to 3pm…a good thing if you have a lazy morning or are just craving breakfast food for lunch. Items are 160 – 290 THB (S$ 7 – 12 / $5 – 9 USD) and include things like French Toast, Pancakes, Eggs Florentine, Eggs Benedict, Omelletes, Steak & Eggs and breakfast sandwiches. I ordered the Bacon & Egg Burger with Cheese featuring smoked bacon and 2 fried eggs with cheese and tomato chutney. 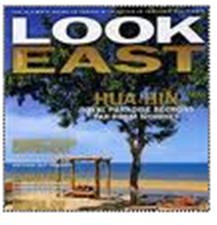 (200 THB / S$8.38 / $6 USD). It was large and filling and probably a great choice if you have overindulged on a Saturday night. The tomato chutney I could have done without…it was rather uninteresting and lacking the characteristic concentrated flavours of a chutney. 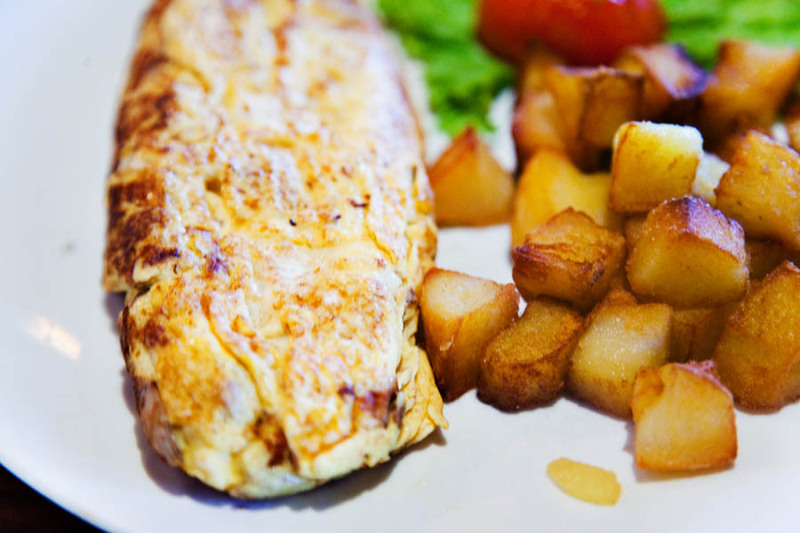 Paul ordered the Mega Omellete with chorizo, cheddar and onion (220 THB / S$9.21 / $6.64 USD). Again another abundant serving. In general the omellete was well executed, but the chorizo was a bit disappointing…not as spicy as one would expect a chorizo sausage to be. Overall I would say our meals were adequate, but if I had to pick a pub breakfast to recommend as a real destination meal, it would have to be the one at the Dubliner. With that said, we still totally recommend The Robinhood for drinking, hanging out and chilling with friends. We especially enjoy it as a relaxing mid-afternoon break from Emporium Mall after shopping.